Our mother was very humble, loving and compassionate. Deaconess Ruth Geneva Green was born on September 24, 1925 to the union of the late Robert and Mabel Chapman, Caroline County, VA. Deaconess Green attended school at the Woolfolk School in Caroline under the guidance of Mrs. Leliao Woolfolk. 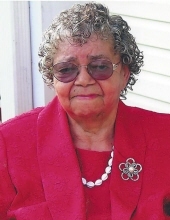 She gave her heart to the Lord Jesus Christ at an early age at the Third Mount Zion Baptist Church in Woodford, VA.
Deaconess Green was a soldier in the army of the Lord that served on the battlefield for a number of years. She was consecrated as a deaconess under the pastorate of the Rev. John Ferguson at the Third Mount Zion Baptist Church. She served as a member of Third Mount Zion Church Deaconess Ministry, Senior Choir and Usher Ministry. Deaconess Green was united in holy matrimony to Forest Turner and this union was blessed with six children. On July 17, 1960, she married Francis Green. From this union, two devoted children were born. This loving mother, grandmother and friend had a kind way of making life pleasant for others. To have known her is to have known someone special, for she was never too busy to lend a listening ear, perform a thoughtful deed, or bring joy to her family and friends. Deaconess Green was a quiet and humble person who loved the Lord with all of her heart, mind and soul. She leaves to cherish her loving memories, her children, Doris E. Carrington, Delores J. Turner, Calvin R. Turner (Shelia), Lenwood H. Turner (Sandra), Shirley M. Childs (Wayne), Mary Y. Childs (Roscoe), Ruth F. Coleman, and Lewis R. Green (Deanna); fourteen grandchildren (one deceased); sixteen great grandchildren; one devoted niece, Theresa Turner; and a host of nieces, nephews, other family and friends. To send flowers or a remembrance gift to the family of Ruth G. Green, please visit our Tribute Store. "Email Address" would like to share the life celebration of Ruth G. Green. Click on the "link" to go to share a favorite memory or leave a condolence message for the family.